If you’ve paid somewhat close attention to the blog since it started four months ago, you may have noticed a slight bias toward par-3s. This isn’t because the blog likes par-4s or 5s any less; it’s more of a visual thing. The overall goal of providing quality content on the blog includes visuals (golf’s a visual game, and perhaps the most visual game, right? ), and par-3s just happen to be largely easier to photograph. That’s not to say you can’t make good or even great photos of some 4s and 5s (you can), but par-3s are just a little easier and even the most novice photographer can grasp why. Anyway, one thing I’ve also noticed about courses is that great ones almost always have great par-3s. When reflecting on my golf season, that’s one thing that occurred to me. I tried to think of my favorite courses throughout the year and in nearly every instance I could easily recall at least one truly outstanding par-3. And, as we know, par-3s in golf come in all shapes and sizes (legal limit being 275 yards, I believe) and beauty or appreciation can often be in the eye of the beholder (I’ll take a one-stroke cliché penalty there) with an obvious birdie/bogey bias. We don’t tend to the love the holes (or courses) that don’t love us back. Well, regardless of what ended up on my card, I can say I love all the par-3s I’m about to list. Since golf is a game of nines, here are nine of my favorite par-3s from the year that, I think, represent the range of what has undoubtedly been the best golf year of my life. I’m going to simply give course, hole number and reflection on these unless the exact yardages are really necessary. I’d like this to be a visual joy ride as much as anything. And there is no attempt to rank here, although my No. 1 is hardly a mystery. Also, for the purposes of being blog-friendly, we’ll do this in three parts throughout the week. We’ll start with the hole of the year, regardless of par or score. The pinnacle of my golf season was standing on this tee box in Maui in July. No. 5 is the second of the consecutive ocean holes on the front nine and the epitome of golfing on the ocean. 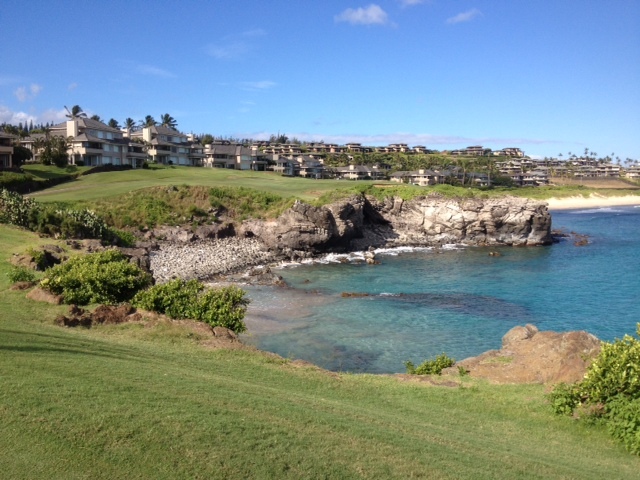 The name Kapalua means “arms embracing the sea” and you rather feel the sea embracing you on this stretch – or trying to blow you off the island depending on the day. Playing out and back on an emerald peninsula, you are completely surrounded by the ocean. We had a gentle breeze the day we played, and I could’ve stood on this tee box for days. It’s golf heaven, as I currently know it. If you’ve ever been, or have golfed in a similar tropical scenario, just viewing the photo probably already has transported you there. Yes, the water is that clear, and waves are crashing all around. You may need to zoom in a little to clearly see the pin, but it was in the front of an undulating green where the wacky physics of Hawaii golf are fully in play. Arnold Palmer did some fabulous work here. I’ve never seen a hole that fits my eye more, and possibly perhaps a little too much. The seductive quality of the hole, and the lack of a guarantee you’ll ever get back here, makes you want to go for broke and chase the ace of your dreams, risking water or crashing on the rocks into a very serene OB. My playing partner, who had played here before, thankfully talked me out of it. That proved to be some wise caddying. I hit a smooth 7-iron and watched my ball find the fairway and track right to the fringe of the green. I walked off perfectly content with a two-putt par. We played a lot of great golf over three rounds in Hawaii, but I didn’t play a more beautiful golf hole than this. It speaks to your golf soul and you spend the rest of your round playing blissfully with your head in the clouds. Bogeys couldn’t dent me the rest of the day. And now for an entirely different kind of “awe” … as in awe-fully hard. 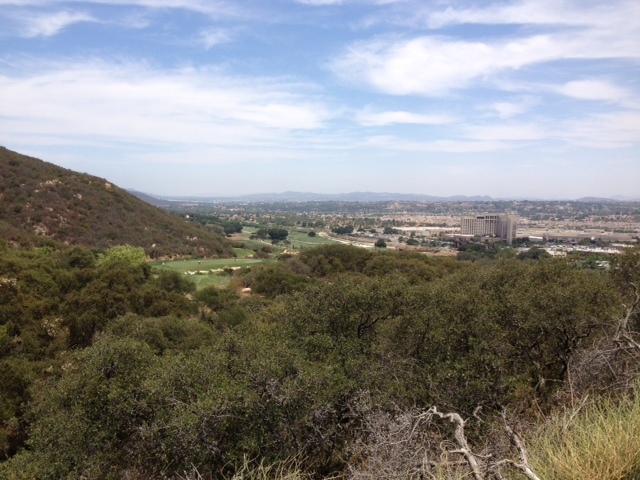 This is the monster par-3 that waits two holes from the finish at Journey at Pechanga. This was the hardest golf hole I played all year, made all the more so by playing it from the tips – 200 yards, all carry, into a mid-afternoon gust. Gulp. A fairly solidly struck 3-wood never had a chance, although my playing partner, a former teaching pro, reached the horizontal oblong green with a terrific Rescue that just caught the right side. A course staff member confided that he’ll go here most days and hit one from the back just to see if he can “get lucky.” Yes, this is what a golf lottery shot looks like. Understandably, this is one of the holes that gives Pechanga its fearsome reputation, but difficulty aside, it’s also one of the holes that gives you views unlike many other places. The four “view” holes on the course highlight a course that is still pretty great when it brings you down from the mountains. If you descend with a par at 17, you’ll have bragging rights in the bar and grill because it’s doubtful you’ll have much scorecard company. I need another run at 17 in 2014 and to try it from the blue tees. Put a par here on my wish list for the New Year. 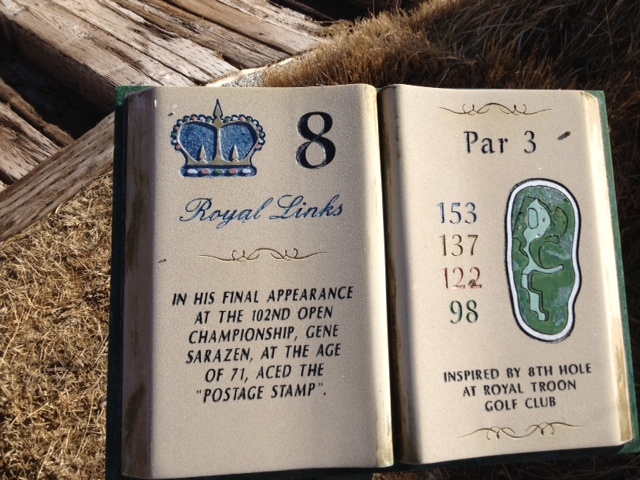 I played Royal Links in February, thus the dormancy, and I was quite stoked to do so. At the time, I was taking my Golf Course Landscape and Design class at golf school and we had just studied links courses. Royal Links, for those unfamiliar, is a replica course with holes modeled after those in the British Open rotation, all routed around a clubhouse that is built like a castle. I had played links-like golf before but nothing that aimed to so closely recreate the British experience. 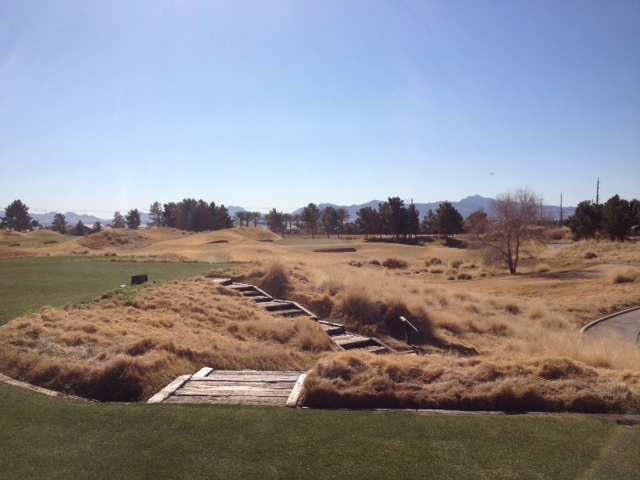 I loved this place and walked away with a major appreciation for links-style golf. I can’t wait to do it again. Until you stand on the tee box of a par-4 with a yardage book in hand that shows 10 scattered fairway pot bunkers, and you see none, you can’t truly grasp the challenge of this style of golf. The more you know your British Open history, the more you can appreciate Royal Links. For those who don’t know, the stone hole markers that are designed like books are only too happy to clue you in. This is No. 8, the par-3 taken from Royal Troon nicknamed “The Postage Stamp.” Played at a mere 153 yards from the tips, this is where Gene Sarazen made ace at age 71 in his final British Open appearance. The photo doesn’t quite do this one justice, but what it doesn’t show is a square bunker off the right side of the green. I recall it clearly because I was in it. It wasn’t the jail that many British Open bunkers can be, but it was challenge nonetheless, so for a score, let’s just go with “What happens in Vegas stays in Vegas,” shall we? Stay tuned for parts II and III of my par-3 series throughout the week. This entry was tagged Bay Course, British Open, Hawaii, Journey at Pechanga, Kapalua, Maui, par 3s, Postage Stamp, Royal Links, Royal Troon, Temecula, Vegas. Bookmark the permalink. Stellar entry Corey. I’ve played some incredible courses in my golf “career” but haven’t managed to get to your #1. A definite “must play” on my list though (along with St. Andrews, Augusta, and the usual suspects.) I will insist that you get out to Kaneohe Bay Marine Corps Golf Course next time your on Oahu. Many consider the back nine to be incredible, and specifically #13, to be the greatest hole in military golf. We’ll have to get there some day. As for tough par 3’s, don’t sell short #6 at Carmel Mountain Ranch. 222yds from the tips and all up hill into the wind. Hit one of the best 3 woods of my life there and still ended up 10yds short!